This is the best image yet of KTM’s eagerly-anticipated new junior adventure bike – the 390 Adventure. The bike is expected to be officially unveiled at EICMA in Milan in November alongside the equally-new, middleweight, twin cylinder version, the KTM 790 Adventure. The new, single-cylinder, dual purpose 390 is largely based around familiar KTM mechanicals and is expected to go on sale in early 2019. Although the pictured bike is a pre-production prototype, its overall neatness and the fit and finish, particularly of its new bodywork, suggest it’s very nearly production-ready. The single cylinder engine and basic tubular steel trellis frame is expected to be virtually identical to that of the current KTM RC390 sportster and KTM 390 Duke roadster, however this Adventure version clearly has larger, 21 and 18-inch wheels which are now off-road-orientated wires rather than cast alloys, longer-travel WP suspension front and rear, more extensive bodywork, particularly at the rear and down the sides covering the rear sub frame and a new mini-fairing we expect it shares with the 790 version. Although the ‘mini-adventure’ class is quickly becoming very competitive with recent offerings in the form of the Honda CRF250 Rally, Suzuki V-Strom 250, Kawasaki Versys-X 300, BMW with an imminent, GS version of its new G310 twin, and Royal Enfield 400cc Himalayan – not to mention a flurry of adventure offerings in the 500cc and 650cc classes as well, the new KTM promises to bring all-new levels of performance and off-road ability to the sub-400cc category. Wheels/tyres: Off-road hoops and semi-dirt rubber promise serious dirt ability. Engine: Essentially the same 373cc single as the 390 Duke, although we’d expect at least gearing changes. Chassis/suspension: Familiar KTM tubular steel trellis but with longer-travel WP suspension front and rear. 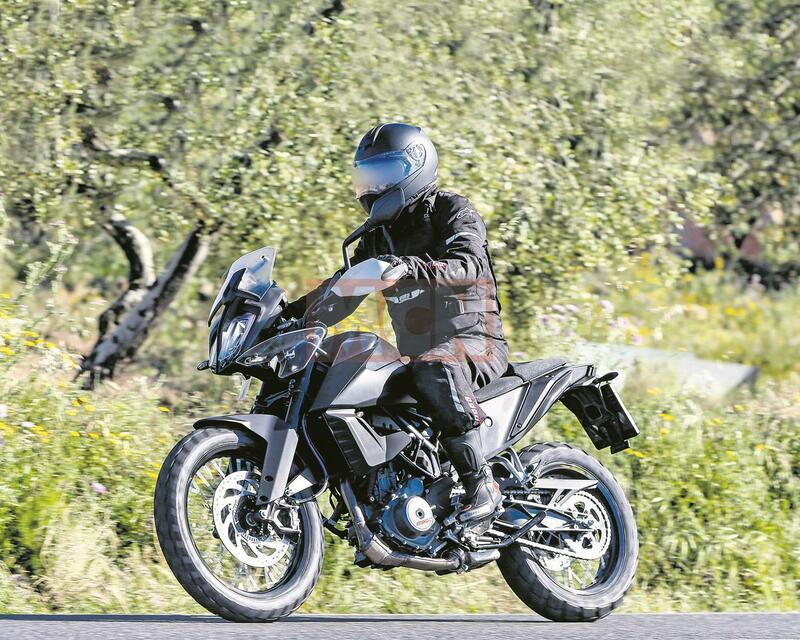 Bodywork: Virtually all-new and likely to be the same as the forthcoming 790 Adventure – more coverage at the rear and sides plus a new, small headlamp fairing. Looking for your next two-wheeled pal visit MCN Bikes for Sale.